Phew, I feel better getting that out. Now, on with the story. So, I went to a Death Over Dinner dinner (I’ll explain what that is later) and brought the bruschetta. While preparing the bruschetta earlier that day, I became so delighted at how wonderfully simple and delicious this antipasto is. 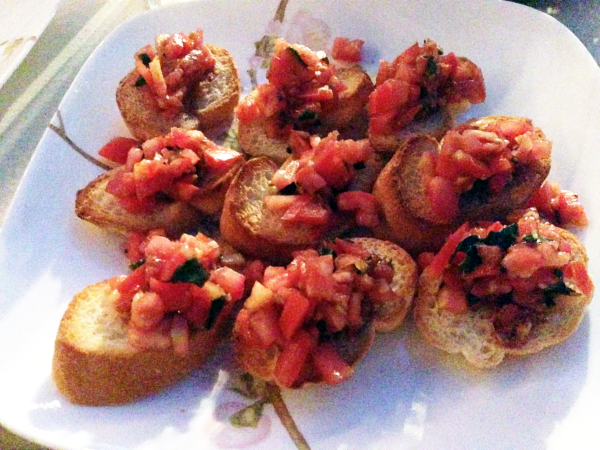 I could not believe that I neglected to incorporate bruschetta in my regular meals. From its Tuscan roots, bruschetta has evolved over hundreds of years, adapting to the flavors and seasonings across the regions of Italy. In the United States, we most commonly know bruschetta as a mixture of tomatoes, basil, garlic, olive oil, and balsamic vinegar served on toasted baguette slices. We see variations in presentation and perhaps some mozzarella and prosciutto (pronounced “pro-shoot -oh”). 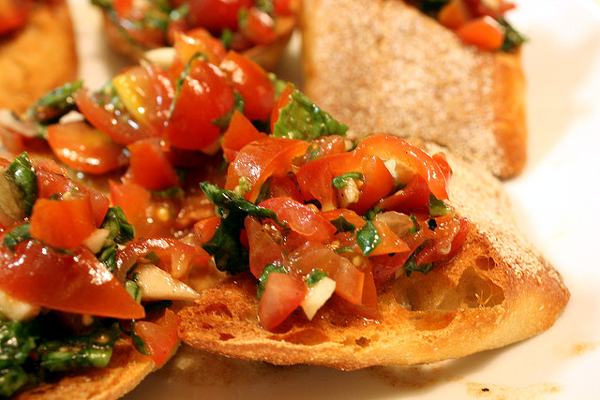 The most important thing you need to remember when making delicious bruschetta is to use fresh ingredients. Choose bright, semi-firm tomatoes (Roma tomatoes are the best, in my opinion) and the freshest, greenest herbs you can find. The oil must be extra virgin olive oil (no oil substitutions this time). But feel free to incorporate thinly sliced italian meats and other herbs, such as oregano, to give your bruschetta a little something extra. Prepare the oven for toasting the baguette. You will want to use the top oven rack for this. Preheat the oven to 450°F. Combine the chopped tomatoes, minced garlic, and basil in a bowl. Add the extra virgin olive oil and balsamic vinegar and mix well. Add fresh ground salt and pepper and mix well. Set the mixture aside. Slice the baguette diagonally into about 1/2-inch thick slices. Lightly brush one side of each slice with extra virgin olive oil, and place the slices oil-side-down on a baking sheet. (You can shmoosh the slices up against each other and place as many on one baking sheet as possible. You might need to toast two batches, though.) Bake for 4-6 minutes, until the slices are slightly golden brown. When the baguette slices are cool enough to handle, grab a slice and place a spoonful or two of the tomato mixture on the non-oiled side. Avoid adding too much juice to the slice or the bread will become soggy. Arrange the bruschetta on a serving plate, and buon appetito!